Learn more about the Supporting Ordained Sangha Fund or make a donation to this or other charitable projects from the website here. 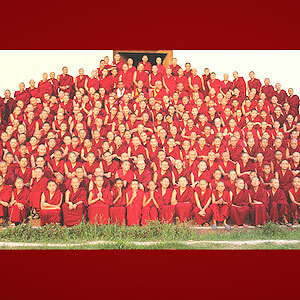 The Supporting Ordained Sangha Fund was established in the tradition of the extremely successful Sera Je Food Fund, which offered three nutritious meals daily to all the monks of Sera Je Monastery for over twenty-six years. Over this time, the food fund established an interest-bearing endowment that will continue to cover the cost of food for this program indefinitely. This Supporting Ordained Sangha Fund is broader in scope and offers support to monasteries, nunneries, and individual monks and nuns for food, accommodation, health care, education and practice. The fund is not limited to any one institution and able to benefit many nunneries, monasteries and Sangha in need. Keep up on the Supporting Ordained Sangha Fund’s latest news.